I had the distinct pleasure of playing both the North and South Courses at Torrey Pines in San Diego recently. I played the South Course (the tougher one) in November and the North Course in February. Many of you know that the US Open was played at Torrey Pines in 2012 and the PGA plays the Farmers Insurance Tournament there every year. What an incredible joy - especially for those of us who love municipal courses (these courses are run by the City of San Diego). In some ways the greens and especially the breaks of the greens seemed very similar to Sheridan. The views along the ocean are stunning but it feels so much more like "home" to me than any other high-end courses I've played in other cities. I've posted some photos out on Flickr - if you're interested click on the links below. If you're ever in San Diego - I'd HIGHLY recommend either of the two 18-hole courses at Torrey Pines. 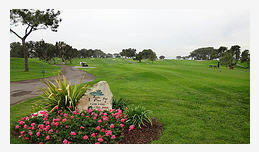 I also had the pleasure of staying at the Hilton Torrey Pines which is right next to the 18th hole of the South Course --- literally walking distance to the course. There's also a great little outdoor patio on the restaurant which overlooks the 1st tee of both courses - I find it a wonderful place for both post round food and drink as well as a great place to have breakfast.